I was wondering what is the role of the carrier wave? Is that a feedback for the user? Is it used to send signals to the drone? RE: What is the role of the carrier wave? So, it is it used to send signals to the drone via dongle. Do you need it to be a sound wave? The EEG uses bluetooth and the helicopter uses infrared. (06-19-2013, 09:03 PM)masmangan Wrote: I was wondering what is the role of the carrier wave? The "carrier wave" is one half of what we call the "control signal" which does indeed instruct the Orbit on what settings it should use to fly. So there's a few parts here. To begin, what you asked - the "carrier wave" (or "carrier signal") is just a steady tone (440 Hz) which is played through the right stereo channel of the infrared dongle. We produce the complete control signal by modulating the carrier wave with the actual "instructions" part of the signal through the left channel. What it all breaks down to is that the IR dongle is a special device which plugs into the audio headphone jack of the mobile phone or tablet being used to fly the orbit and converts the sound we play into pulses of infrared light. If we want to fly the Orbit forward across the room, we need to specifically tell the helicopter to apply (say) 60% of maximum power to the throttle (upward direction) plus 70% of the maximum pitch (forward direction). We also need to tell it to keep the yaw (left/right rotation) in the middle, or at 50% (so it is neither turning left nor right but flying straight). The way we do this is to actually send those three numbers (plus any other numbers the Orbit expects to receive) again and again many times per second. You can see this visualized in those above links. 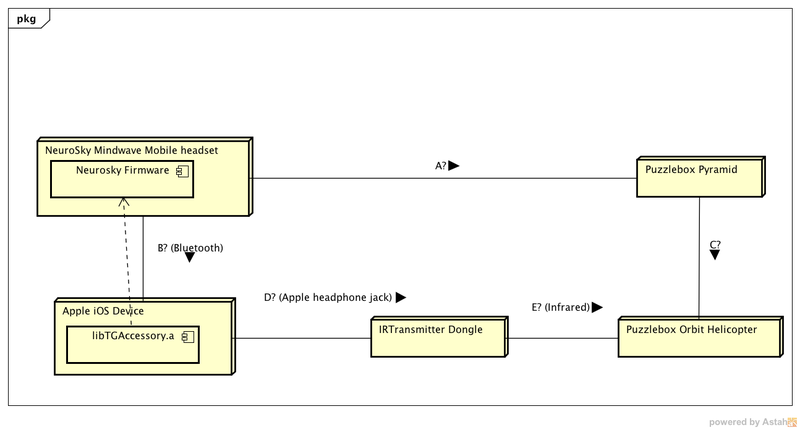 The IR dongle receives this audio stream and converts it directly into pulses of flashing infrared light. You can literally see this in the WAV file of the control signal if you zoom in far enough. When the wave hits peak amplitude, the light flashes on. When it falls back down the light turns off. The Orbit receives these flashes of light, is able to work out the numbers being transmitted, and adjusts power as instructed.